A Potato Perspective on Crossings, Ideas and Matter is an investigation on ideology, power and knowledge in relation to breeding. The project consists of two parts; a presentation of different narrative suggestions on the ideology and epistemology of breeding and a potato breeding program within the framework of the mobile community garden Prinzessinnengärten in Berlin. During the last century, human life conditions have more and more become politicized, thus also breeding. The potato plant has played a major role for the demographic and economic development in Europe during industrialism. For the breeding program, we use the system of so-called recurrent mass-selection, which is a rather marginalized method that does not require advanced scientific methods though it has a high potential for success. By using this technique, we wish to reflect on the circumstances that made it almost abandoned. 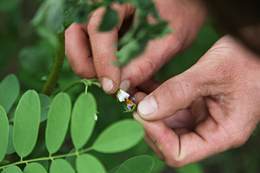 The breeding program is carried out by the artist, gardener Matze Wilkens and many volunteers at Prinzessinnengärten.